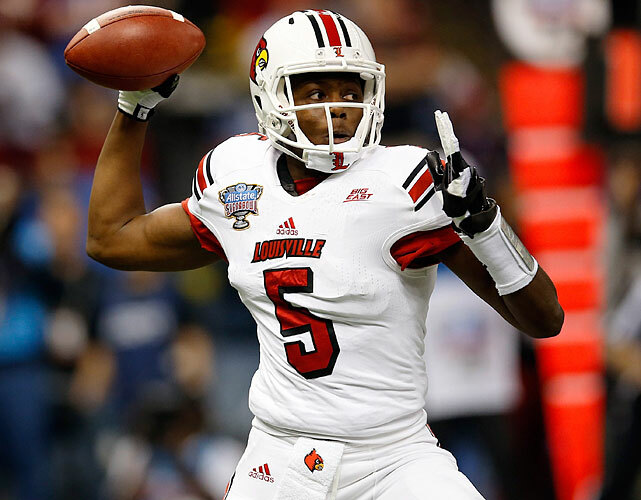 Before the season began, Louisville QB Teddy Bridgewater was considered the top quarterback prospect for the 2014 draft. In 2013, Bridgewater passed for 3,970 yards (10th nationally), 31 TD (12th nationally) and only 4 interceptions (7th nationally for all QB with over 100 attempts). His passer rating was 171.45 (5th nationally). For some reason many draft analysts have dropped him behind Johnny Manziel and possibly even Blake Bortles and Derek Carr. This puzzles me. What else did Teddy Ballgame need to accomplish? Wins? His team won 12 games. Their only loss was to Central Florida when Bortles rallied his team from behind for the win (after Bridgewater put his team ahead with 3:00 left). The lack of a BCS bowl win? A team can only win the games on its schedule. Ultimately, despite a 12-1 record, Louisville had to settle for a berth in the Russell Athletic Bowl. No Heisman trophy? Despite a very good year, Bridgewater could not measure up to the year Jameis Winston had in leading the Florida State Seminoles to the BCS Championship. Size? Seriously? Bridgewater is a giant compared to Johnny Manziel who has moved ahead of him in most rankings. I’ve watched Teddy Bridgewater for three years and if I were a GM, I would bang the table for this kid. As a raw freshman, his talent was obvious. His freshman stats included 2,129 yards, 14 TD, 12 INT and a 64.5% completion rate. His stats in each category improved every year. He is a humble person who refused to campaign for the Heisman Trophy, focusing instead on team goals. Bridgewater is the undisputed team leader that his teammates love. When the game matters the most, Bridgewater has the ability to put the team on his shoulders and will them to a win. The kid lives in the film room and has great preparation. Bridgewater has a smooth delivery and good footwork. His accuracy is very good and he makes good decisions. He has worked in a pro-style offense and can make all the throws. Some scouts are concerned about Bridgewater’s frail frame, but he has proven over his career that he can take a hit and will play when he is injured. In his sophomore season, the Cardinals needed a win over Rutgers to advance to a BCS bowl. Bridgewater came into the game with a broken left wrist and a sprained ankle. During warm-ups, Coach Charlie Strong decided to go with Will Stein as the starter. Trailing 14-3 at the half, Strong put Bridgewater into the lineup. Playing with a noticeable limp, Bridgewater rallied his team to a 20-17 win and a berth against the Florida Gators in the Sugar Bowl. Against the Gators, Bridgewater took a ferocious hit from linebacker Jon Bostic and never missed a beat. The Cardinals upset the Gators and Bridgewater took home the Sugar Bowl MVP trophy. In my mind, Bridgewater is still the top quarterback available in the 2014 NFL Draft. Did he have a bad pro day? Yeah, but it’s just a pro day. If it comes down to a pro day vs. game film, I will trust what I see on game film. Jamarcus Russell had one of the best pro days anyone has seen and he was a 1st round bust. If I’m a GM and I need a QB, I’m picking Teddy Bridgewater and never looking back. This entry was posted on April 23, 2014 by draftmaniacs in Draft profiles and tagged 2014 NFL draft, NFL, NFL Draft, Teddy Bridgewater.